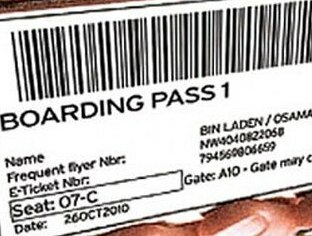 2010: LHR News (a British Airways internal staff magazine covering Heathrow Airport), publishes an image of a boarding pass for Osama bin Laden, the world’s most wanted terrorist. The photo accompanies an article spelling out the benefits of BA’s new mobile-boarding pass system. The image features a frequent flier number for passenger bin Laden, and has him flying first class on October 26, 2010. 2010: Detroit Tigers pitcher Armando Galarraga is denied a perfect game against the Cleveland Indians when first-base umpire Jim Joyce mistakenly calls Jason Donald safe on a two-out ninth-inning ground ball. "I just cost that kid a perfect game," says Joyce afterwards. "I was convinced [Donald] beat the throw, until I saw the replay." Galarraga finishes with a one-hit, 3-0 win. 2001: The first prototype of NASA’s unmanned X-43A hypersonic aircraft is destroyed during its maiden flight after a booster rocket carrying it aloft veers out of control and falls from the sky. 1997: At Waterworld USA in Concord, California, a group of more than 30 high school seniors ignore a lifeguard’s warning and attempt to simultaneously slide down the Banzai Pipeline, a 75-foot-tall waterslide. The ride collapses, killing a 17-year-old girl and injuring 32 others. 1985: The Union of European Football Associations (UEFA) bans English football clubs from competing in Europe following the death of 39 Italian and Belgian fans at Brussels’ Heysel Stadium during a riot caused by English hooligans. 1970: Car racer, designer and manufacturer Bruce McLaren is killed when his McLaren M8D loses its back end and collides with an earthen embankment at the Goodwood racetrack in England. 1943: Film actor, director and producer Leslie Howard (best known for his role as Ashley Wilkes in Gone with the Wind), dies when his plane—traveling from Lisbon to London—is shot down by Nazis who suspect Winston Churchill is aboard.